When it comes to reducing your pack weight, reducing weight on the big three often has the biggest impact with just a few items. The big three is the backpack, tent/shelter system and the sleep system (sleeping bag and sleeping mat). One thing that saves a lot of weight and bulk is to choose a down sleeping bag instead of a synthetic one. Down weighs less for the same insulation, compresses better and have a longer lifespan without loosing loft. A way to save even more weight is to switch from a sleeping bag to a quilt. In the ultralight community quilts have become more or less the standard. A quilt, as opposed to a sleeping bag, doesn’t have a hood, and is also open in the bottom, where your sleeping pad insulates you from the cold. This saves weight as it uses less material. For colder weather a down hood can be used, which add warmth but is more flexible than a sewn hood on a sleeping bag. Another great feature with quilts are that it’s easy to regulate temperature and they’re easy to get in and out of. Quilts come in different versions. There are ones without the sewn in foot box. These can be opened up like a regular rectangular quilt at home, which gives great ventilation and an easy way of regulating temperature. The foot box can be closed with zippers, buckles and draw stings. One negative thing about these quilts is that in theory the foot box doesn’t get as warm as a sewn in foot box since it’s not completely sealed. The other version is a quilt with a sewn in foot box. 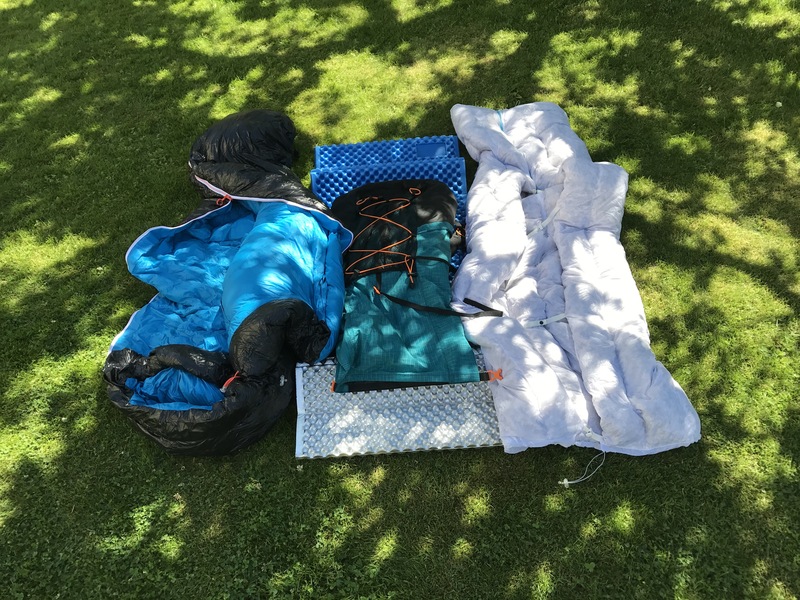 The bottom of the quilt looks like a sleeping bag, which makes it a bit warmer than an open quilt, but you also loose ability for configurations and ventilation. The quilts can be used as a regular quilt at home, where you just wrap it around you, but for colder weather you’d want to prevent drafts. To do this most manufacturers have straps that you wrap around your sleeping pad and then secure to your quilt. This will make the quilt stay in place when you move around in your sleep. I switched to quilts for three season use in 2016, but it took a while for me to get used to it. My quilt was a Cumulus Quilt 350, and I had a hard time getting the straps to work good without getting cold drafts. I was close to selling it and go back to using sleeping bags when I finally found a way that works; Using the lower strap around the pad, with the quilt above it, move the upper strap to the middle of the quilt, securing it under the pad with the quilt down to the sides. Since I got it to work without drafts I started to really like quilts. Especially since I toss and turn a lot at night, and also like to sleep on my belly. Having a quilt, that doesn’t have a hood and that you don’t get tangled up in, works very well for this. Below is a list of some of the most known quilt makers. Cumulus is a polish brand that makes sleeping bags, quilts and down clothes. They make high quality gear at a reasonable price, and their products are common in Sweden. I’ve bought several items from them over the years and I’m very happy with both the products, the service and the price. They recently (2018) updated their line of quilts, so they now come without a sewn foot box and with an updated strap system. Katabatic Gear is by many considered to be the best in the industry, with very high quality on their products. There are a number of different configurations you can do, with both width, length and fill. They are, however, a very pricey. Hammock Gear is another company that often gets recommended. Especially their Econ quilts when it comes to recommendations for getting ultralight on a budget. For us Europeans customs and sales taxes would probably push the price up a level where it’s not price worthy anymore. Enlightened Equipement is an American cottage brand. Unlike most other companies Enlightened Equipment uses vertical baffles instead of horizontal. I’m not sure if there’s any benefits with the design, but if I remember correctly it’s designed like that to be able to push the down up and down to where you’d want the most warmth. There is a bit of a lead time to get the quilt, but they regularly go on sale on Massdrop. As Tucas is a small European cottage brand founded in 2013. As Tucas makes both synthetic and down quilts, as well as bivy bags and clothes. I recently decided to wash and wax my canoe. In retrospect I read that you really don’t have to wax canoes with a polyethylene hull since the wax won’t stick anyway, so in one aspect it was unnecessary. But waxing the canoe exposed what seems to be an issue with the mold. The hull was covered with small air bubbles and holes, most of them in the aft and stern, and less in the middle. The holes got filled with wax, and thus easy to see with the naked eye, and with a closer look I saw that there where air bubbles inside the plastic. Some of the holes where also fairly large. I took a couple of photos and asked about it in Reddits caone forum and got the answer that it should definitely not look like that, and that I should contact Mad River about a replacement. I’ve read before about issues with the hull on these models but I thought it had been sorted out. I’ve contacted the retailer and Mad River, and now I hope for the best. I haven’t heard back from the retailer yet, but Mad River was forwarding the info to the fabric. Since I was considering selling it I guess the best case scenario would be to get the money back, especially since the shipping alone of a new canoe costs 150€ (should be covered by the warranty but I don’t know). If the manufacturer doesn’t come through, selling it with these issues would mean loosing a lot of money, if it’s even possible. Now I’m just keeping my fingers crossed that everything works out with Mad River and the retailer as fast as possible. With the never ending heat stroke we have here in Europe I’m more and more leaning towards canoe camping in Femundsmarka rather than hiking in Hardangervidda, to have constant access to the lakes for cooling off. But with a potentially weakened hull I’m not too keen on taking it on a week long trip far out in the wilderness. I hope everything works out before I leave. I got in contact with the retailer again, who said that according to Mad River the issue was just a cosmetic one, that doesn’t affect durability or function, and nothing they will return it for. I’ve also emailed their European contact, who forwarded the images to the factory, but said he thought it looked like a cosmetic issue. If this is accurate it’s nice to not having to hassle with shipping it back to the retailer. My wife and I have been out on more short canoe trips, and now she has started to like canoeing and wants me to keep the canoe as a family canoe. I’ll save up for a more lightweight canoe for solo use in the future though. I’m not all too pleased about having paid full price though, as this probably affects second hand value. I do think that Mad River should offer a partial refund. It’s no secret that I really like my Tentipi Olivin. It was love at first sight, and I don’t regret buying it. It is however a lot heavier than my the Hyperlite Mountain Gear Ultamid 2 that I owned before I bought this shelter. The Ultamid, with pegs, all the guylines attached, polycro groundsheet and polestraps weighted just under 1000g. My Tentipi Olivin with the 3F UL Gear floor weighs 2325g. The gram geek in me just couldn’t let that stand, so I looked at ways to reduce weight. There are 12 perimeter anchor points, and 6 guylines. I had 18 Y-pegs, but changed 6 of them to Toaks Shepard Hooks. They weigh less than half of a Y-peg. I also ordered Hyperlite Mountain Gear polestraps to use my trekking poles instead of the dedicated center pole. The centerpole with its bag weighs 484g. The polestraps weighs 36g. I’ve switched the original tent bag for my Luxe Outdoor stuff sack that weighs 22g instead of 67g. I’ll also skip the bag with the repairkit and the pitching aid, which saves me 29g. I could save 220g more if I use my polycro groundsheet instead of the silnylon floor. That’s it. With a few simple moves I could reduce 572g from my shelter system, with another 220g easily removed if I want to. It still not a UL shelter if you count it as a one person shelter. But it’s still quite a lot lighter than before. I’ll try this new setup the next time I’m out. Other than that I ordered a Hyperlite Mountain Gear stuff sack pillow when I ordered the pole straps. The stuff sack pillow weighs the same as the old stuff sack that I used to store my down jacket in, but I can skip the inflatable pillow, which sheds another 49g of my base weight. Hopefully it’ll also improve my sleep, as the air pillow isn’t that comfortable. Over and out from the gram geek.